Remember when Joe Kelly was the Ferrari stuck in the garage? Without a defined role, without many opportunities. He was jumped over for spot starts by the AAA flame throwers like John Gast and Tyler Lyons. Meanwhile, Kelly sat. Now, twice in the last week Kelly has been the guy. The stopper … literally. He stopped the Cardinals’ seven-game losing streak last Thursday, then last night he stopped the Dodgers’ 15-game road winning streak. And, he out-dueled one Clayton Kershaw in the process. There was much to clap about as the Cardinals defeated the Dodgers 5-1. The once-forgotten son silenced the hot Dodgers bats through the first five innings, due in part to three double play balls, giving up just one run in the sixth. That run ended Kelly’s own streak of scoreless innings, but the “fill-in” starter has an 0.78 ERA over his last four starts. Not too shabby. Since turning double plays is oh-so-fun, Kelly and Randy Choate did the honors of loading the bases in the sixth, perhaps just so Seth Maness could do the Maness thing. There may not be proper words to explain the magic of Maness anymore. So, Derrick Goold just decided to redefine the name itself. Maness is now a verb. To Maness is to conjure double play out of thin air. He Manessed to get #Cardinals out of that inning. He's Manessing. That ended one threat. Tony Cruz ended another. After a leadoff double by Juan Uribe to start the seventh, Nick Punto laid down a bunt to move the runner to third. Except, Cruz has done his homework. 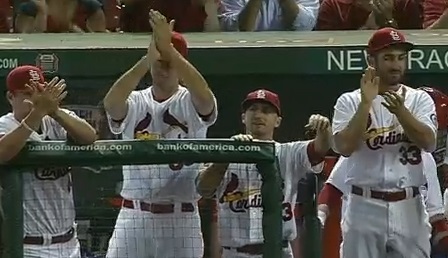 Watching Yadi all these years certainly hasn’t hurt. As the ball stayed in front of the plate, Cruz snatched it up and snapped the throw to third base with Uribe coming on. The tag by Freese was in plenty of time, and another RISP situation was handled. You know, that’s one of my favorite things about baseball. We all hated to see Yadi forced to the DL. We all prayed it would only be 15 days, and that the Redbirds could manage to hang on without him. There’s no replacing Yadi. But, Mr. Cruz is doing a fine job, both behind the plate and with the bat. His single in the fifth plated the Cardinals’ first run. You just never know who will step up and surprise you. Against a good team, there are limited opportunities. The Cardinals have not played particularly well in close games as of late, and as the innings ticked away, and the Dodgers continued to create chances for themselves, the pressure began to mount. The 2-1 lead wasn’t particularly comfortable. Trevor Rosenthal and Kevin Siegrist handled the setup responsibilities, as it appeared Edward Mujica would get his first save chance since July 25. There would be no play call controversy this night, though. Carlos Beltran — swinging, not bunting — blasted his 20th homer of the season to give the Cards a little breathing room in the eighth inning. “Big City” Adams, though, wanted a smidge more room. With his two-run shot, Matt became first Cardinal with with three pinch-hit homeruns since Ryan Ludwick accomplished the same feat in 2007. More young guys stepping up. Oh, and Mujica was just fine. Ground out, ground out, single (of course), and a ground out. It may not have been a save opportunity, but it was nice to see the Chief is staying sharp. It’s amazing to me how things can go so terribly wrong for a week or so, only to turn around at the hands of the Joe Kellys and Tony Cruzes of the baseball world. That’s the beautiful of this game. So long, frustrating streaks. The Ferrari is out for a joy ride, and you happened to get in the way. Shelby Miller will try to secure at least a series split tonight as he faces Ricky Nolasco on ESPN’s Wednesday Night Baseball. This entry was posted in 2013 Season, MLB and tagged Busch Stadium, Cardinals, Carlos Beltran, Clayton Kershaw, David Freese, Joe Kelly, Jon Jay, LA Dodgers, Los Angeles, Matt Adams, Mike Matheny, Pete Kozma, Seth Maness, Shelby Miller, St. Louis, Tony Cruz by Tara Wellman. Bookmark the permalink.